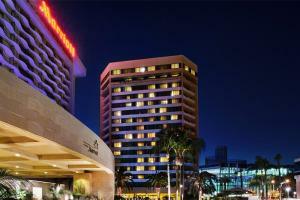 Combining luxury accommodations with superior service, the Anaheim Marriott invites you to book your dream vacation at this Disneyland® hotel in California. Located in the heart of the Anaheim Resort District, all 1,300 hotel rooms feature high-speed Internet, plush bedding and tasteful decor to provide an escape from your daily routines. Located just 14 miles from the John Wayne Airport. Disneyland® Park, Honda Center, Knott's Berry Farm, Newport Beach.